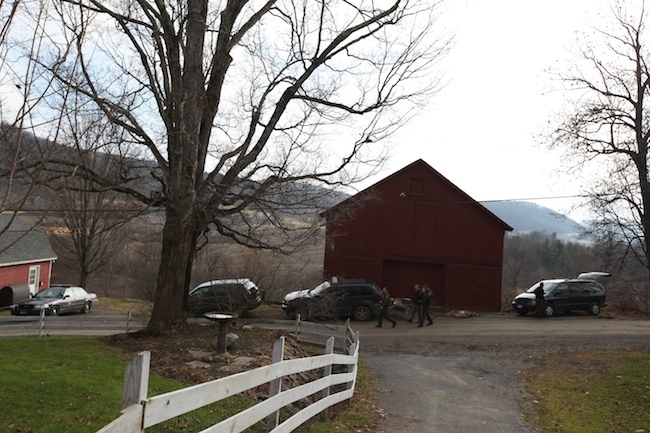 State Troopers and Wildlife and Environmental Police swarmed to the farm Sunday to try and unravel a still mysterious encounter between a hunter and a landowner involving several dead deer and a bunch of gunshots. The troopers went deep into the woods and up the hill to check out reports of gunfire, and haul some dead deer out of the woods. There was a dispute, and still is, but that’s all I really know about it, other than that on my morning walk with Maria’s mom we heard a lot of gunshots right ahead of us and we retreated. Nobody was hurt, at least no humans. The dogs remain locked up. Life in the country, and on the farm, is never dull. Writer’s paradise.